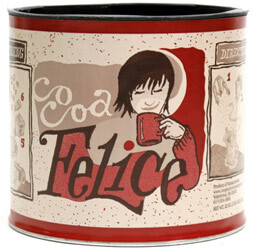 Cocoa Felice is an all-natural non-dairy hot cocoa mix that’s made only with vegan-friendly sugar and real European Dutch process cocoa, and it makes the richest, most chocolaty drink imaginable. Just add 2-3 tablespoons of Cocoa Felice to your favorite hot vegan milk alternative, add any extras that make it even better (try cinnamon powder, ground ginger, or almond or vanilla extract for a new twist! ), stir, and enjoy! There’s also an excellent recipe for creating amazing chocolate pudding with Cocoa Felice on the package as well, giving you another way to enjoy this great authentic hot cocoa mix. Large 22 oz. (624g) jar is $10.49. From Anonymous of Detroit, Michigan on 5/18/2015 . From Flossiesfine of Byram Township, New Jersey on 1/22/2015 . Finally a hot chocolate for my daughter that tastes normal..
From Anonymous of Harrogate, Tennessee on 6/3/2014 . This product perfectly sweet. It may be too sweet if most candy and cakes are too sweet for you and you almost never eat sweets. I can't imagine this being too sweet for the average person. I love how easy it is to make this hot chocolate, and there's even a pudding recipe on the can. From Anonymous of West Bend, Wisconsin on 4/3/2014 . Kids will probably like this, but it's very sweet. I add a non-sweetened cocoa to this to make it more drinkable.